Objectives To investigate general practitioners’ (GPs) experiences in managing patients with intellectual disabilities (ID) and mental and behavioural problems (MBP). Design Qualitative study using in-depth interviews. Setting General practice in Hedmark county, Norway. Participants 10 GPs were qualitatively interviewed about their professional experience regarding patients with ID and MBP. Data were analysed by all authors using systematic text condensation. Results The participants’ knowledge was primarily experience-based and collaboration with specialists seemed to be individual rather than systemic. The GPs provided divergent attitudes to referral, treatment, collaboration, regular health checks and home visits. Conclusions GPs are in a position to provide evidence-based and individual treatment for both psychological and somatic problems among patients with ID. However, they do not appear to be making use of evidence-based treatment decisions. The GPs feel that they are left alone in decision-making, and find it difficult to find trustworthy collaborative partners. The findings in this study provide useful information for further research in the field. The aim of this study was to investigate the general practitioners’ (GPs) experiences in managing people with intellectual disabilities and mental and behavioural problems (MBP) in order to identify factors related to high-quality services, important areas for improvement and suggest fields for further exploration. This study shows that GPs have different opinions on central subjects in providing high-quality services to people with ID and MBP. Even GPs with an assumed high competence and engagement in this patient group lack evidence-based knowledge and base their actions on experience-based practice. GPs are concerned about the competence in specialist departments when it comes to treatment of MBP in people with ID. Participants were of both genders, from several localities and had a broad range of patients with ID and MBP. As far as we know, this is the only study that has addressed GPs’ experiences with people with ID and MBP. Although data across participants were found to be sufficient, a small group of participants were interviewed. People with intellectual disabilities (ID) are particularly vulnerable to health problems and experience difficulties in meeting their healthcare needs.1–7 Two recent attempts provide a focus to this challenge: a consensus manifesto by the European Association of Intellectual Disability Medicine8 and an independent inquiry on a request from the British Secretary of State for Health.9 These reports share the goal of improving healthcare services for people with ID, but the extent to which their recommendations have been implemented remains dubious. Similarly, guidelines have been developed in other countries.10–12 Courses are also available: for instance, in Norway, an internet course from the Norwegian Medical Association,13 and internationally, a course from the International Association for the Scientific Study of Intellectual and Developmental Disabilities.14 It is, however, not clear how widely such training programmes for GPs are used. The importance of closely monitored care and high-quality health services to meet the challenge of inequality in health services for people with ID has provided the focus for several papers.1 ,3 ,5 ,6 ,26 There are, however, few studies that have looked at the way GPs are working with patients with ID and MBP. The aim of our research was to explore the experiences, attitudes and perceived role and competence of GPs providing health services to patients with ID, with a special focus on patients with ID and MBP. We opted for a qualitative approach, in order to obtain more detailed descriptions of the GPs’ experiences serving patients with ID and MBP. In-depth interviews are suitable in inquiring about the GPs’ experiences, facilitating a deeper understanding of their opinions and attitudes.27 ,28 We preferred open interviews to focus on each participant's descriptions and experiences, and to bring narratives into the method, by giving participants the opportunity to provide meaning to their responses. Data were drawn from a total of 10 interviews with 10 participating GPs aged 41–64 (table 1). Participants were chosen following recommendations from an acknowledged senior psychiatrist with more than 30 years of experience with ID patients in collaboration with GPs in Hedmark county. There are 173 GPs in Hedmark, and the senior psychiatrist considered 25 of them to have more than the usual level of experience with ID patients and a relatively large number of ID patients on their list. A letter was sent to 15 of these GPs, purposefully selected with regard to geographical location and gender. Ten GPs were able to participate, three GPs refused to participate and two GPs did not respond. Participation in this study was voluntary, and each participant signed an informed consent form, and was informed of their right to withdraw from the study at any time, without further explanation. What are your experiences with ID patients who have additional mental health problems and/or a challenging behaviour? What do you think is the GP's role for these patients? The additional checklist was used to gather information that was otherwise missing or to provide greater depth or breadth to incomplete information. Follow-up questions were taken from a list of keywords: number of patients with ID on the GP's patient list, collaborative partners, regular health checks, specific training on the topic, perceived knowledge, knowledge of evidence-based literature on the topic and attitude towards psychotropic treatment of people with ID. The interviewers made field notes with the participants’ frequently used words, phrases and other statements requiring follow-up. Pauses, engagement, laughter and gestures were also noted, and the field notes were used in addition to the total transcripts. The 10 interviews generated approximately 119 pages of single-spaced text. Analysis of transcripts was conducted using systematic text condensation.27 ,29 ,30 TF read the transcripts several times to obtain a sense of the whole. The other authors independently read the transcripts and identified meaningful units, themes and subthemes, trying to capture the ‘essential expression’. These findings were discussed among the authors. During the interview, GPs described their experiences, consultations and collaboration with a variety of relatives and professionals. Case presentations included descriptions of ID patients with complex medical, psychiatric and behavioural challenges. GPs shared examples of the kind of challenges they were facing in managing these patients. It could be a patient with Down syndrome, psychiatric illness and difficult to control diabetes. Other patients could be aggressive both verbally and physically and not willing to participate in tests in a typical consultation at the doctor's office. Some of the patients lived alone with little community services, and were having a lifestyle with several potential harmful traits, like smoking, drinking alcohol or eating disorders, and limited cognitive resources to understand the consequences of their actions. 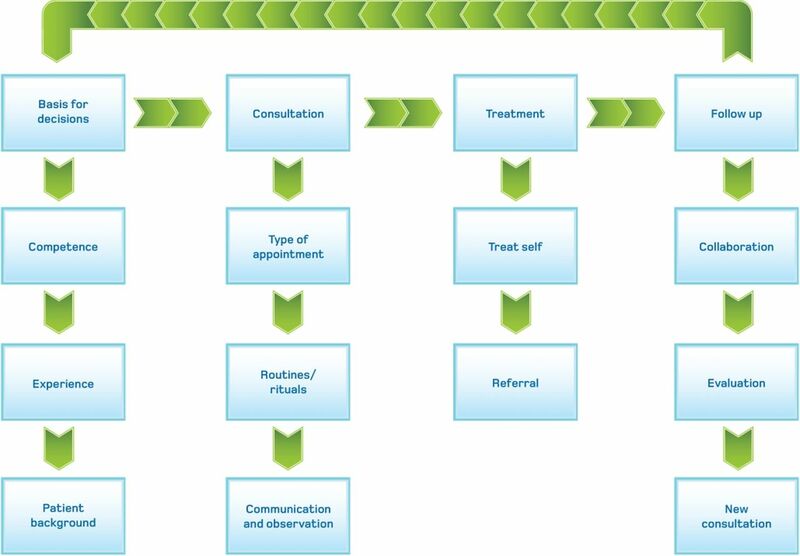 As a model of analysis, the process of a consultation emerged from the material as the best description of the GPs’ experiences with this group of patients (figure 1). This model illustrates a GP's pathway through a consultation with four main categories: basis for decisions, consultation, treatment and follow-up. Model with themes and subthemes. Communication and observation constitute another cluster of experiences in this category. Some of these patients are obviously anxious about a consultation, and all GPs said that their focus was on the patient, communicating directly with the ID patients, even though they were accompanied by others. If something could not be done because of unwillingness or restlessness, they did not push the patient, but booked another appointment in the near future. Some participants were more likely to use systematic consultations and follow-up, especially if the patient had chronic somatic problems. Nevertheless, the somatic problem, rather than the ID and MBP, constituted the main reason for systematic and frequent consultations. Some of the GPs interviewed had created a private system to ensure systematic follow-up: prescribing medication over the short term and developing exclusive lists with patient data and consultation frequency. This fourth main category constitutes a cluster of descriptions covering collaboration, evaluation of treatment effects and routines for follow-up consultations. The participants reported their experiences with collaborative partners—particularly how they evaluated the effects of psychotropic medication. As schemes or more objective feedback forms were not often provided, the participants were forced to rely upon normative assessments provided by accompanying health workers or parents. The results in this study highlight the complexity of providing GP services to people with ID and MBP. The GPs interviewed in this study were strategically selected and were expected to have above-average engagement and competence with this patient group. Evidence-based medicine requires a combination of clinical expertise, best available external evidence and individual patient needs and choices.31 The competence of the participants in this study is generally experience-based on this topic and therefore characterised by individual opinions and ways of working. The participants described limited education on ID issues, and none could refer to any scientific article, book or report on this topic. Even though there has been a course directed to GPs on ID patients, with a subcategory on MBP, none of the participants had attended it. This study implies that GPs with more than the usual level of experience, and interest in patients with ID and MBP, rely on experience-based knowledge, and have limited knowledge of articles, guidelines, reports or books on this topic. The fact that the management of patients with ID and MBP is rarely taught in medical school and the only course available is an internet course may contribute to the understanding of limited evidence-based knowledge among the participants. In addition, our results imply that this topic is rarely mentioned in scientific papers or on conferences and courses with GP participation. The participants in this study were strategically selected, thereby representing a relatively homogeneous group. This situation creates an obvious threat to external validity, and may limit the generalisation of our results. Nevertheless, the interviewees revealed diverse opinions and descriptions of their managing of ID patients with MBP, thereby strengthening our impression that this is an important research topic, albeit rarely investigated or highlighted in national or international settings. Everyone in our research group has read and analysed the transcripts and independently noted meaningful units. The group comprises researchers and clinicians from several areas, thereby limiting the threat of a subjective finding with idiosyncratic perspectives and limited objective value. Our findings can be transferred to clinical situations and can provide a good starting point for further research in the field. The results demonstrate a major challenge to the treatment of MBP in people with ID: none of the participants were sure how to treat these patients themselves, yet they were unsure where to refer their patients if they found the situation too complicated for primary healthcare treatment alone. They tended to distrust specialist health services. In some areas of the county, the GPs mentioned a local hospital psychiatrist, and other participants mentioned specific persons with whom they could collaborate. All in all, these statements serve to underline the importance of knowledge and information exchange between potential collaborative partners. Our study shows that GPs’ management of patients with ID and MBP is primarily based upon experience-based knowledge—as told explicitly and as demonstrated through individual descriptions of management and treatment. The GPs’ opinions about working with ID patients is based on their own experience with this patient group, and with their general competence related to patients without ID. Attention should be focused on the ways in which medical training and postgraduate education can fill the competence gap, to ensure that this field becomes evidence-based rather than merely experience-based. Guidelines for GP management of people with ID, with a subcategory focusing on MBP, should be developed and disseminated in Norway. The authors would like to thank the GPs for their participation.
. Previously unidentified morbidity in patients with intellectual disability. Br J Gen Pract 2006;56:93–8.
. European manifesto: basic standards of healthcare for people with intellectual disabilities. Salud Publica Mex 2008;50(Suppl 2):s273–6.
. Healthcare for all: report of the independent inquiry into access to healthcare for people with learning disabilities. London: Aldridge Press, 2008. [Internet]. Primary care of the adult with intellectual disability (mental retardation). (cited 23 Jan 2013) http://www.uptodate.com/contents/2779 (accessed 5 Feb 2013).
. International guide to prescribing psychotropic medication for the management of problem behaviours in adults with intellectual disabilities. World Psychiatry 2009;8:181–6.
. Primary care of adults with developmental disabilities: Canadian consensus guidelines. Can Fam Physician 2011;57:541–68. The Norwegian Medical Association [Internet]. Allmennlegens møte med utviklingshemmede (In Norwegian). http://nettkurs.legeforeningen.no/course/view.php?id=47 (accessed 4 Jan 2013). International Association for the Scientific Study of Intellectual and Developmental Disabilities [Internet]. https://www.iassid.org/ (accessed 5 Feb 2013).
. The relationship between challenging behaviour and mental ill-health in people with intellectual disabilities: a review of current theories and evidence. J Intellect Disabil 2008;12:267–94.
. The relationship between psychiatric symptomatology and motivation of challenging behaviour: a preliminary study. Res Dev Disabil 2008;29:408–13.
. Models of collaboration between general practice and mental health services in Italy. Eur J Psychiatry 2007;21:79–84.
. Collaboration between general practitioners and mental health care professionals: a qualitative study. Int J Ment Health Syst 2011;5:13.
. Experiences with general practitioners described by families of children with intellectual disabilities and challenging behaviour: a qualitative study. BMJ Open 2011;1:e000304.
. General practitioners’ opinions on their practice in mental health and their collaboration with mental health professionals. BMC Fam Pract 2005;6:18.
. Intellectual disability psychiatry: a practical handbook. Chichester, West Sussex, UK: Wiley-Blackwell, 2009.
. ‘Sometimes I feel overwhelmed’: educational needs of family physicians caring for people with intellectual disability. Intellect Dev Disabil 2012;50:243–50.
. General practitioners’ attitudes to patients who have learning disabilities. Psychol Med 2002;32:1445–55.
. Mental health services for people with learning disabilities. Medical needs are important too. BMJ 2001;322:302.
. Interviews: learning the craft of qualitative research interviewing. Los Angeles, CA: Sage, 2009.
. The art and science of clinical knowledge: evidence beyond measures and numbers. Lancet 2001;358:397–400.
. Antipsychotic medication for challenging behaviour in people with learning disability. Cochrane Database Syst Rev 2004;(3):CD000377.
. Psychopharmacology and mental retardation: a 10 year review (1990–1999). Res Dev Disabil 2000;21:263–96.
. Use of psychotropic medication among individuals with mental retardation. Tidsskr Nor Laegeforen 2009;129:1751–3.
. Psychotropic medication in adults with mental retardation: prevalence, and prescription practices. Res Dev Disabil 2004;25:509–21.
. Identifying the patient perspective of the quality of mental healthcare for common chronic problems: a qualitative study. Chronic Illn 2007;3:46–65. Contributors TF contributed to the acquisition of data, transcription, analysis of data, drafting and critical revision of the article and approval of the final version. ORH, LJD and LL contributed to the design of the study, analysis of data, critical revision of the article and approval of the final version. KK participated in the interviews, analysis of data, critical revision of the article and approval of the final version. Funding This study was funded by the Norwegian Medical Association. The funding body had no involvement in the research process or in the writing of this article. Ethics approval The Norwegian regional committee for medical research approved this study, ethical approval number 10-2008 SI.